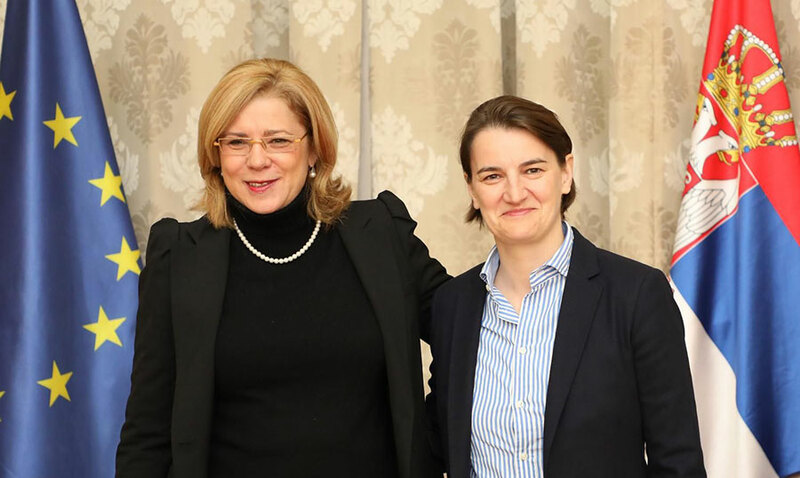 On the second day of her visit to Serbia, Commissioner for Regional Policy Corina Crețu met with Prime Minister Ana Brnabic and Minister of European Integration of Serbia Jadranka Joksimovic. Serbian PM thanked for Commissioner’s personal commitment to enlargement policy and support for efforts Serbia is making to meet the membership criteria. Brnabic said that full-fledged membership in the EU was the most important foreign policy priority of Serbia, adding that strengthening of regional cooperation and pursuing of reconciliation policy substantially contribute to attaining that goal, reads a statement released by the Government. She also said that economic development of both Serbia and the region would not occur unless regional stability is maintained and good neighbourly relations improved. She particularly pointed to importance of the Western Balkans regional economic area Action plan, given that its implementation will significantly contribute to further cooperation. Speaking about regional cooperation, they agreed that Serbia is already an active participant in a series of regional initiatives, such as the Berlin Process and WB6, which provide a broad framework for acting and stepping up cooperation not only among the countries in the region, but also with the EU. They said that major infrastructure projects had been agreed within the Berlin Process, such as the construction of the Nis-Pristina-Tirana highway and a gas interconnection with Bulgaria. Brnabic said that in 2018 Serbian Government would remain committed to fiscal discipline, which has yielded good results, and work toward digitization and education reform. She added that she deemed education reform to be a prerequisite for the long-term progress of the country and modernisation of the society. Crețu said that Serbia is an important partner when it comes to cooperation in the area of Danube and Adriatic-Ionian macro-regional strategies, assessing its participation in those strategies as an exceptional opportunity to prepare for and open new chapters, especially those dealing with the regional policy and coordination of structural instruments, reads a press statement released by the Prime Minister’s Office. Minister of European Integration Jadranka Joksimovic thanked Commissioner Crețu for standing ready to assist Serbia in setting up a mechanism necessary to absorb and use EU funds. In that context, she pointed to importance of cooperation in the areas of cross-border cooperation and macro-regional strategies, Danube and Adriatic-Ionian, as well as cooperation regarding chapter 22 – regional policy and coordination of structural instruments – reads a statement released by the Minister’s Office. During the meeting, Joksimovic stressed the importance of EU’s financial assistance, as regards the 2014-2020 financial perspective, which amounts to some EUR1.5 billion in non-refundable aid. The importance of cooperation between Serbia, on the one hand, and Bosnia and Herzegovina, Montenegro, Croatia, Hungary, Romania and Bulgaria, on the other, was also highlighted. She said that the CBC programme with Macedonia would also kick off in 2018. Joksimovic and Crețu agreed that cross-border cooperation contributed to extreme visibility of EU development aid. They said that projects implemented thanks to EU’s aid were highly noticeable at the local level. Serbia is the most successful user of pre-accession funding among the candidate countries, Crețu said. She added that by doing so, the country is enhancing its capacity for taking part in the cohesion policy in the future and the capacity to use substantially higher funding it would have at its disposal once it joins the EU. Crețu congratulated Serbia for taking an active approach to the Danube and Adriatic-Ionian macro-regional strategies and commended the quality of cross-border cooperation with all neighbours. She brought Joksimovic closer to activities carried out in view of implementing new post-2020 financial framework, pointing to importance of the EU Regional Policy and its effect on regional and local development, the statement reads.